the last leg — ...and we're off! We pulled into San Francisco around 10pm Saturday night, just in time for some drinking with old New York-expat friends. We visited Sharin’s new apartment not far from South Park before going out in the neighborhood. Our friend Mike was good enough to let us spend the night at his place, and we met up with the same crew the next day for brunch. As seems to be usual in San Francisco, some more New Yorkers were in town and we were able to meet Jason and Jackie at the Fort Mason farmer’s market. We found some awesome Afghan spinach bread and tasty hummus there too. We finished our 18 hours in SF with a long walk around Russian Hill, our California Mexican food-stuffed bellies and slight hangovers warning us to avoid any hills. San Francisco is one of my favorite cities and we would have loved to spend more time there, but we had a few more places to be before our flight left Phoenix that Wednesday. That chilly afternoon we went over the Bay Bridge, through Oakland, over the hills and down into the Central Valley. Each mile further from San Francisco Bay brought a few more degrees of warmth. Within an hour we had gone from wearing zipped-up jackets to holding a pillow against the window to block the sun. The San Francisco microclimate always amazes me. Pulling onto I-5 toward Los Angeles we were surprised to find that the best road connecting two of the top five largest metro areas in the country is only two lanes each way. Traffic moved OK for the most part but it was bumper-to-bumper 70 mph the whole way. This being California, our decision to stay back a safe distance from the car in front of us usually meant an invitation for another person, with a weaker love of life, to wriggle his way in and try to board the car in front of him via the trunk. The drive ended with a spectacular traffic jam in the San Gabriel Mountains before we arrived in Manhattan Beach an hour late that night. We stayed two nights with our friend Nick in LA, who had just moved down from San Francisco and was renting an apartment within a five minute walk of the beach. Plenty of time was spent wandering around Manhattan and Hermosa Beaches and the weather was perfect. We caught up with our friends David and Jamie Monday night in in Santa Monica, where I had some very strange tasting (and very California) Cabernet-flavored beer. The next morning (ok, afternoon) we were off to San Diego to meet up with our friend Dave and his family, who just happened to be visiting at the time. We stayed right on Pacific Beach in a hotel where Dave’s family had an extra bed. Everyone had a great time and we were able to meet the adult version of Dave’s brother William, who goes to college there, for the first time. 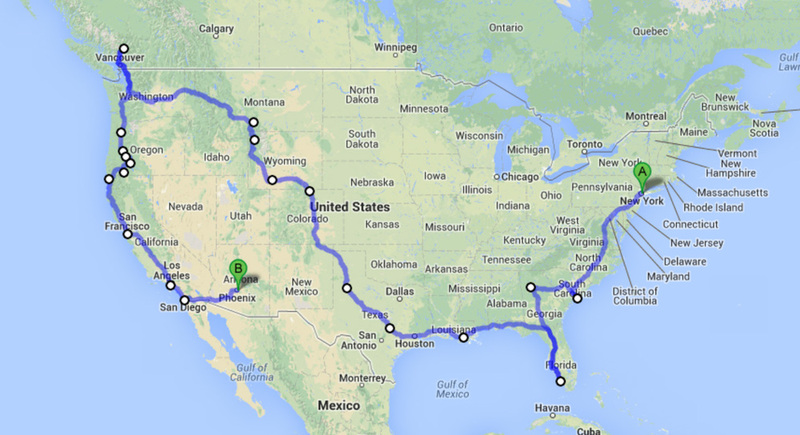 Wednesday morning was officially the last day of our 2.5 month road trip around North America. The M3 sped through the desert toward Phoenix on Interstate 8, heading due east for the first time since around Syracuse, NY. Again, the weather went from chilly and cloudy to very hot, then to unbelievably hot. We passed through Yuma, a place I’d seen on maps but never thought I would be, and marveled at the level of agriculture in that valley. Phoenix was 109 degrees that day and still well over 100 when we pulled in around rush hour. After 14,800 miles of solid driving and not enough car washes, the front of the car looked like a sun-baked entomologist’s lab. We did what we could at a nearby car wash, then found my grandparents’ old mobile home in a retirement community in Tempe. The place is uninhabited in the summer (it had to be over 120 in there), and we tried to avoid heat stroke while repacking our bags for the flight home. That night we were finally in the air, quietly reminiscing about the road trip of a lifetime but very excited to sleep in our own bed and more excited for the next leg of our adventure in Europe.